Last Saturday, I was down at the Farmer’s Market on Lemon and Main, searching for ideas that would be interesting to write about. Peperonata Empanadas were there, but sadly, I had found so many interesting treasures by the time that I got to their stall, that the only thing I had left was some pocket lint. I did however grab a card, and was pleased to learn that they have a brick and mortar store near Trader Joe’s on 41. A young Chef, Stefania Fochi, is the maker of these wonderful little pies. Much like myself, she decided at an early age to go to cooking school. Armed with passion for food, a love of her Argentinian / Italian culture and the steel-clad fortitude of an enteprenuer, she started her empanada company. All of the recipes that contribute to the making of an empanada have all been developed by Stefania and her family. A make-or-break point for any empanada is the dough, and her’s is absolutely perfect, developed by her father over a 3-year period. She takes the time to make all of the fillings from scratch, using only the best ingredients available. Although empanadas are made in many countries in Latin America, their’s are shrouded in Argentinian tradition…from the dough, to the fresh, flavorful fillings. Chef Fochi offers a number of empanadas, from the traditional, to those that she has created for “the American palate.” I tried 3 different empanadas on my visit, and they were all very good, but my favorite was the humble beef empanada. I love the saltiness of the green olives with the sweetness of the golden raisins, and the rich umami flavor of the beef. I’m a self-admitted nerd when it comes to food history, and different cultures from around the world. Not only do I enjoy cooking and eating dishes, but, my hunger truly isn’t satisfied until I learn the back-story. The truth is, nobody really knows where empanadas orignated, or how old they are. They have been documented in a Catalan cookbook that was published in 1520, but their roots are much older. The word “empanada” comes from the Spanish verb “empanar” which means to wrap in bread. Many believe that they were inspired by the samosa in India, and brought to Spain by maurading invaders. Spanish explorers brought them to most regions of Latin America, and even The Phillipines. 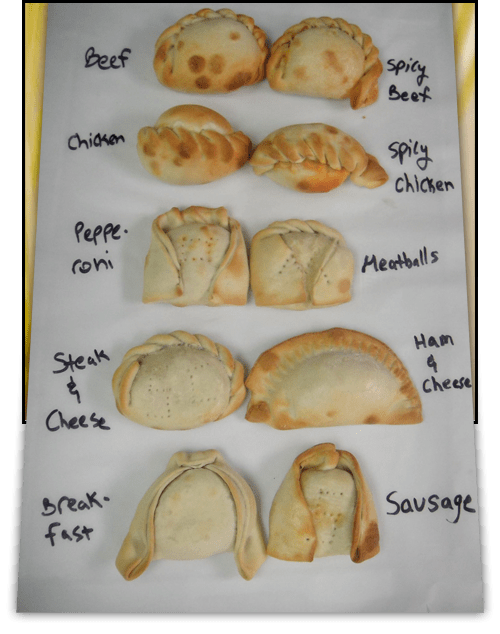 An interesting aspect of empanadas are the fact that many cultures around the world nosh on something similar, whether it is the Italian Calzone, Polish Pierogi, Indian Samosa, German Struedel, British Pasty, or heck, even the white-trash American Hot Pocket! One of the factors that I find the most interesting about empanadas are that the maker can identify the filling, based on the way the dough is folded. This is also a trick of artisan bakers, making distinctive marks on the bread for identification. I grabbed this picture from their website so that I can show you what I’m talking about. In closing, I had an awesome lunch today, while listening to the torrential rain outside. Please go and enjoy this quintessential street food. 4141 S. Tamiami Trail #13, Sarasota, Florida 34231, Click Here For The Website. Sounds terrific, I look forward to reading more on your search for incredible food!